The Egyptian national was fatally injured in the incident aboard the Endurance in November 2016. AN INVESTIGATION INTO the death of a man onboard a fishing vessel 200 miles off the south-west coast has found the “speed and force” of what happened meant there was no way for any other crew members to prevent his death. An Egyptian national was fatally injured after an incident on the MFV Endurance just after 6.30pm on 8 November. The nets were extremely heavy on the starboard side while they were being hauled, an investigation by the Marine Casualty Investigation Board (MCIB) has found. As the crew member attempted to retrieve the net, he became strapped between that and the starboard side stern quarter. When the net swerved sharply, it brought the man with it, crushing him against the starboard rail and carrying him over it with the force of the net. While the crew were able to prevent him from falling into the water, the man suffered serious injuries. The vessel made contact with the Coast Guard and Medico Cork via radio. The crew administered CPR to the man to no avail. 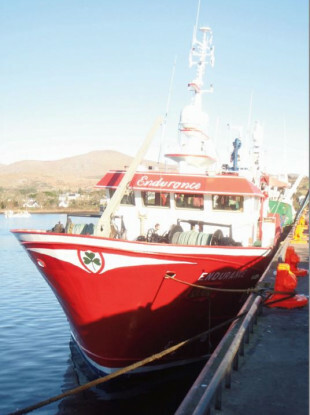 The vessel – out of west Cork – returned to port at Castletownbere, and the deceased man was removed to Cork University Hospital. Post-mortem results found his death was caused by haemorrhage and shock with a laceration of his parts of his heart – aorta and inferior vena cava – due to blunt force trauma to his thorax and abdomen. Toxicology results showed that THC-COOH, the most psychoactive of the principal constituents of marijuana, was detected in the man’s urine. The MCIB determined that while weather conditions had deteriorated as the day went on, it hadn’t gotten bad enough to halt the hauling of the nets. While not unusual, the net was extremely heavy potentially due to stones and debris from the seabed picked up during the trawl for prawns. “It is not possible to determine how crew member seven (the man who died) came to be in the position underneath the net through the gap between the net drum and the deck,” the MCIB said. The position puts crew member seven in a danger zone between the net and the starboard rail. Due to the speed and force of the incident, it did not give the man an opportunity to call out or take action being pushed over the rail by the net. Similarly, the crew did not have a chance to take action or intervene to prevent him being carried over. It added that remedial works had been carried out by the owner to prevent a recurrence of such an incident. Email “Probe finds crew member 'carried by force of net' and crushed against rail in boating tragedy”. Feedback on “Probe finds crew member 'carried by force of net' and crushed against rail in boating tragedy”.